The multifaceted man, Dr Prem has means and intent to provide assiduous training complying with the varying requirements of the individual. In similarity with his other endeavors, Dr Prem’s training services are not confined to a specific territory, country or region. Instead of focusing on a specific area or niche, the venerated trainer takes pleasure in conducting numerous focused workshops and presentations on a bevy of topics in over 30 countries. Dr Prem focuses on providing a congenial and conducive environment facilitating great learning. 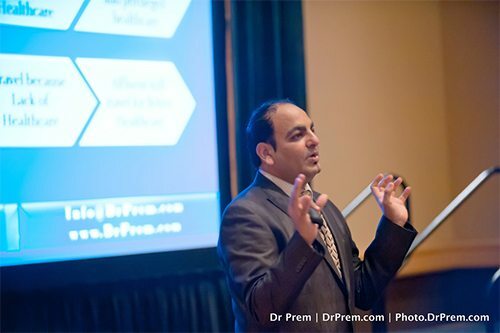 A man of integrity, Dr Prem possesses the professional credentials and credibility essential for a trainer. Personal Brand and Self Development, Medical Tourism Training, Leadership, Management and Business training or for that matter Healthcare Training, Dr Prem can cater to it all with remarkable professionalism. In his career as a trainer, he has thus far fashioned thousands of careers and the count is swelling by the day. Dr Prem emphasizes on interactive training in each of his well-researched programs, which further stimulates the thought process of participants. The training programs, therefore, allow participants to interact freely, and enhance their knowledge through facts, figures, tips and eye-opening success stories. His training sessions are characterized by case studies, group discussions, practical problem solving in addition to question and answer sessions allowing for comprehensive and seamless learning. Courtesy his years of experience, sharp intellect and extensive knowledge, Dr Prem is delivering life-improving counsel and guidance on a variety of subjects through different programs and seminars. Embracing an empathetic attitude, the eminent trainer recognizes the fears and uncertainties that his audience fosters while learning additional techniques or skills. To make the learners feel at ease, he is willing to put himself in their shoes. Patience is a key virtue for a trainer, and Dr Prem has it in abundance. His patient reflects in his willingness to compliment slow progresses and avoidance of anger when things do not work out as expected. The trainer is of the view that it is better to maintain a slow yet steady rate of progress instead of pushing for rapid and sloppy completion. The affable trainer employs a blend of novel and proven techniques and methodologies ensuring better understanding and a rewarding experience. He reveals no demur in repeating instructions and chunking down a task into small units while remaining complaint with the learning abilities of the aspirant. A venerated Personal Branding expert, Dr Prem strives to drive home the multifarious advantages of personal branding to individuals and business establishments of varied sizes. Through his in-depth understanding of personal branding fundamentals and his years of experience, Dr Prem provides diligently designed and comprehensive personal branding programs. Be it personal branding training, public speaking training, self-brand website training or presentation skills training, the endowed trainer has the character and intent to cater to it all. Moreover, he also extends an array of training services pertaining to personality development, business etiquettes, personal finance and entrepreneurship. All the training services comply with the norms and standards appreciated globally. Dr Prem flaunts an impeccable record of accomplishments in healthcare segment and healthcare training is his specialty. Bringing his experience in the healthcare sector to the fore, Dr Prem focuses on providing bespoke, industry oriented and all-inclusive healthcare training to individuals and businesses endeavoring to augment their growth prospects. The bouquet of healthcare training services is constituted by coaching sessions and workshop programs. Dr Prem excels in providing global healthcare training, healthcare marketing training, pharma sales training, healthcare human resource training, healthcare outsourcing training along with healthcare event management training. The list of training is not complete yet as he also offers healthcare public relation training, healthcare business development training, medical writing training, healthcare brand management training and healthcare public speaking training. A revered medical tourism expert, Dr Prem is offering an array of assiduous medical tourism training services to all forward-looking stakeholders in the industry. The training solutions not only provide insight into prudent ways to enhance the tourist influx but also ensure a competitive edge. The Medical Tourism training portfolio incorporates industry oriented medical tourism training along with medical tourism facilitator training. Quality and cost effectiveness remains the most prominent aspects of the medical tourism training on offer. The entire range of training programs offered by Dr. Prem is a result of painstaking efforts from few venerated and seasoned professionals and medical training courses are no exception either. The knowledge and fresh idea these men and women brings to the table makes the training courses even more desirable and result oriented. They convert their research findings and experience to provide a practical approach for the course participants. Driven by the desire to create business leaders of the future, Dr Prem is offering a bevy of leadership training solutions for individuals and business establishments across industries. These training sessions encompass all possible aspects of leadership, management and business essential for thriving in this intensely competitive scenario. Dr Prem provides leadership training, business management training and sales management training. Those aspiring to have insights into business strategy, business operations, customer service, marketing, time management, corporate social responsibility, and lean culture development can also opt for training offered by Dr Prem. Realizing the significance of communication in the current business scenario, the endowed trainers also offers quality training in communication in addition to Product and Service Development, Project Management, Negotiation, along with Mergers and Acquisitions. A man of ethics, Dr Prem endeavors to inculcate business ethics into the professionals through his business ethics training. These programs have proven credentials in enabling the aspirant in exploring leadership skills and unleashing the business leader in them. Individuals who wish to create a niche for themselves in HR and Admin has a realistic chance of doing so by opting for HR and Admin training and interview skills training offered by the eminent trainer. Last but not the least, Dr Prem offers exceptional trainings in business valuation, change management, team building, corporate wellness, developing lean culture and lean management. Intended at imparting a new way of thinking in continuous learning, Dr Prem & Associates is high on providing a variety of superior yet cost effective online training courses. Flexible in nature, the online courses allows the aspirant to pursue them at his or her convenience and pace. The online training courses on offer encompass impeccably written, easy to read and understand content on all the key areas of knowledge. Dr Prem and Associates thrives on quality and hence they ensure that all of the courses remain complaint with the global norms and standards.